Member timesheets are now processed through TimeTracker. Getting set up is a 2-step process. Visit our website to get started. Members, did you know you may be eligible for food stamps (aka SNAP)? We have a list of resources that can help you stretch your stipend. Macros, National Bullying Prevention Month, and a hardy soup recipe to usher in Fall in this month's Live Well, Work Well. Check out our website for lots of valuable resources and information - including due dates, member benefits, outreach materials, online training courses, and more! To attend, RSVP by October 8! 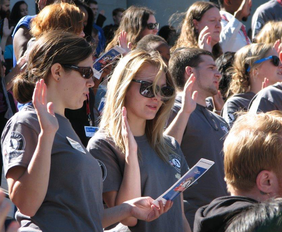 Join AmeriCorps members from across the state in the annual swearing-in ceremony in Seattle on October 26. Learn more about the event and how to RSVP. Dates and sign-up forms have been posted! Attendance is required. Site staff: look forward to a phone call from your Program Coordinator in the next couple weeks! How are things going? How can we help? Pop quiz: how many WSC staff are national service alumni? Check out our new staff bio's to learn this and much more! Learn about the services and resources available through MAP! Orientation webinar on October 10, 10:00am. Click here to register and receive login info. 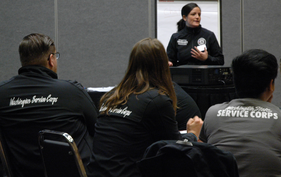 WSC*AmeriCorps gear will be distributed at the in-person member training sessions. Thinking of pursuing a higher ed degree after your service term? Talk to recruiters from highly acclaimed schools through Service Year's Virtual Grad Fair on November 8. Must pre-register!